We need more information in order to offer help with your plant pest problem. What exactly are you seeing? And can you send photos? 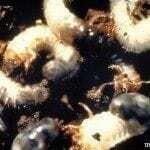 "Grubs" usually refers to insect larvae in the soil that may feed on plant roots. Insect pests on cycads include mealybugs, which appear as white fuzzy masses, usually on the underside of the leaves. Is that what you are seeing? If so, wash them off with a strong jet of water, or wipe them with a rag or cotton glove. After you reduce the amount of pests present, Neem oil spraying will help with suppression.